Back in Ye Olden Days, I knew nothing of blogs and was content to post materials on forums and newsgroups and the like. I contributed a few writings to GameFAQs back before the days when it was purchased by GameSpot. The only actual FAQ for a video game I ever contributed that described how to beat a game was for the VIC-20 game Ultima: Escape from Mt. Drash. When GameFAQs took over, I removed all my content from that site. Now, having finally been able to play the game on original hardware, I think it is time to revive the old FAQ. Moreover, no longer limited to plain, monochrome text, I can do more now that I have my own blog and the ability to add images, color text and link video. Let's take a trip into a rarely visited part of the Ultima Universe. The object of this Ultima is to escape the fortress of the Garrintrots, located on the top of Mount Drash. The evil Garrintrots have given you a chance to earn your freedom by descending the 15 maze-like levels of the mountain, each level having an exit leading into greater danger. You have to navigate and descend 15 levels of these mountain mazes, dodging or fighting monsters. Connect a Commodore C2N 1530 Datasette to the VIC-20. Connect the VIC-20 to a composite monitor or a TV. Ensure the VIC-20 power supply is connected to an outlet and turn the VIC-20 on. Wait for the VIC-20's BASIC to load and proceed to the next step when BASIC displays the READY prompt. Insert the Ultima - Escape from Mt. Drash cassette into the cassette player. If the tape is not fully rewound then do so now. If the tape is fully rewound then hold down the key and press the key, or type LOAD at the BASIC prompt. The screen will say "PRESS PLAY ON TAPE", so press the play button on the cassette player. The screen will say OK, find the game on the tape, and load the game into memory. This should take about three minutes. Be patient. At the title screen, press any key and the game will load the first level at the introductory screen. 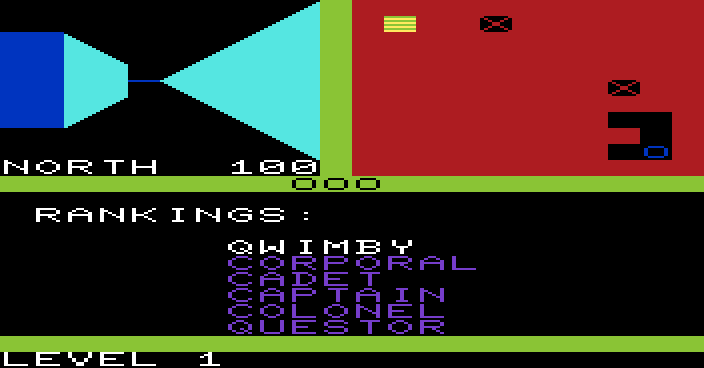 The game begins when the game's screen has been fully displayed on the monitor. To restart the game, turn the VIC-20 computer off then on again, rewind the tape, and repeat steps 7-10. Alternatively you may lose all your lives. Only the keyboard functions as a controller in this game. Level 5 - Starting on this level, you must grab a gem before you can use the exit. Level 7 - Starting on this level, the maze no longer appears on the map screen. Level 9 - Starting on this level, the monsters are no longer visible on the map screen. Level 11 - Starting on this level, the your character is no longer visible on the map screen. Also, as the level numbers increase, the monsters move faster in combat. remaining, and when you are entering a new level. The map screen, on the upper right portion of the screen shows the location of you, the monsters, the exits, the gems, and the layout of the level as you explore it. The levels are semi-randomized. You only have three lives and cannot gain any more. The action screen, below the view and map screens shows your current rank and when you encounter a monster the fight between you and the monster. The status bar, below the action bar, tells you the level number, the name of an enemy, and when it dies or the number of times you have died. position on the map is marked with a blue o (lowercase.) You can avoid many enemies but will inevitably have to fight some. They are marked with red Xs. Fortunately, they cannot pass through walls but will chase you. They can group together, so one X mark can hide multiple enemies, which you will fight sequentially. Each level is a 9x9 matrix, and you have 100 seconds to clear it or you lose a life. When you have to collect the gems, there will be two, located at the northeast and southwest corners. They are designated by yellow diamonds. One good thing is that the monsters cannot pass through the gems, until collected, or the exit. You have three lives and cannot earn anymore, and each life is designated by a black o lowercase character in the center of the screen. You can cast spells three times per level, any combination of the three. The Teleport Spell will teleport your character to a random location on the map. The Blast Spell will demolish one section of the wall, but will not always work and will never work on the outer edges of the maze. The Sleep Spell will put the monsters to sleep for three turns. The Sleep and Teleport Spells always work, but if the Blast Spell does not work it will count as one of your used spells. game over text, no matter how many lives you have. You win the game by going through the dimension door on level 15, escaping the wicked Garrintrots and Mt. Drash. with an accompanying gif. You only have to do this once per monster encounter, but hitting that spot is more difficult that it first appears. If you counterthrust your sword out in front of it too early, it will move back. If you counterthrust too late then it will move inside your sword reach and you are probably dead. If it touches your stick figure body, you lose a life. If this happens then quickly assume the ready position with and quickly thrust with and hope this pushes the monster back. Until you get the range down, when you first begin a battle counterthrust your sword out with . (See my ASCII art for a depiction of each combat move.) This will protect you from an automatic death and give you more distance to work with than the thrust movement because the monster will not move forward and kill itself voluntarily. When the monster comes close to your sword, it will walk back and forward one step in front of your sword point. Wait for it to walk back and then use the key to pull yourself back somewhat into a thrust position. This will protect you from instant death if you fail and will trick the monster into moving itself into range of a successful counterthrust. When the monster moves forward again, counterthrust your sword with . You want to get the monster as shown in the monster kill points gif, described in the next section. Keep trying until you kill it. In the early levels, use the break and teleport spells to seek the monsters out for practice. when they move. It does not work so well against Phantoms and Purple Slimes because their movements are hard to track and they live in levels where the monsters move faster in combat. It also becomes difficult to use on the later levels because the monsters move so fast, but it still works when you have trained yourself to track their movements. Also, combat may not start the player off in the same position relative to the monster every time, so this technique is no substitute for learning the monsters' kill points. counterthrust as quickly as possible. This works reasonably well even when the monsters move their fastest. game only processes updates about once per second, so if you miss an opportunity you had best hope your sword pushes the monster back and allows you another chance to make another counterthrust correctly. Each monster has two frames of movement, so you have to learn where to strike on either frame. Also it is important to remember that this game only uses PETSCII symbols for its graphics, so everything is confined to 8x8 cell boundaries. Combat is the only challenging aspect to this game. As I have described above, you must counterthrust your sword at exactly the right point for each of the two frames for each monster. Unfortunately, I cannot describe the kill points of each with as much precision as I would like. There are 9 monsters on this level, and you will fight all of them. No spells will work on this level, and at best you can only lose 2 fights. Earning new ranks seems to be a combination of killing monsters and advancing in the levels. Regardless of the monsters killed, the game will not reward the player with a new title until he reaches the next set of levels. Oddly, when you die for the third time the game says "You lose, cadet" (I think someone was a fan of Gorf) regardless of your rank at the time of your death. Questor - Win the Game! Combat with monsters garners it own theme. Casting the sleep spell uses another theme for the duration of the spell. The winning and game over theme are the same. Casting the blast spell gives a sound effect (and WinVice doesn't get it quite right). Walking has another sound effect. K. What Does this Game Have to Do With the Ultima Series? including a cloth map and a box for each copy of the game. Only Sierra On-Line agreed to do this, so he licensed the game to them to distribute Ultima II for the Apple II and other computer platforms. He also gave Sierra a license to port Ultima I to the Atari 8-bit Computers, and Sierra ported Ultima II to a variety of platforms, including the IBM PC, the Atari 8-bit Computers, the Commodore 64, the Apple Macintosh, the Atari ST.
Anyways, at this time, Garriott's friend and collaborator Keith Zabalaoui approached Sierra Online and asked if they would like to sell a game he had written for the Commodore VIC-20 computer in BASIC. He agreed to do so, wrote a maze game with a simple fighting capability. (The game does contain some machine code in binary.) Sierra thought it would sell better if they stuck Ultima onto the title of the game, supposedly unbeknownst to Garriott who claimed he learned of the game's existence years later. Actually he later admitted he lent the Ultima name for the game, presumably to help out his friend. Sierra released it in 1983, and presumably it did better than it would have otherwise, but considering its rarity as the most sought after Ultima item, it was not a best seller. 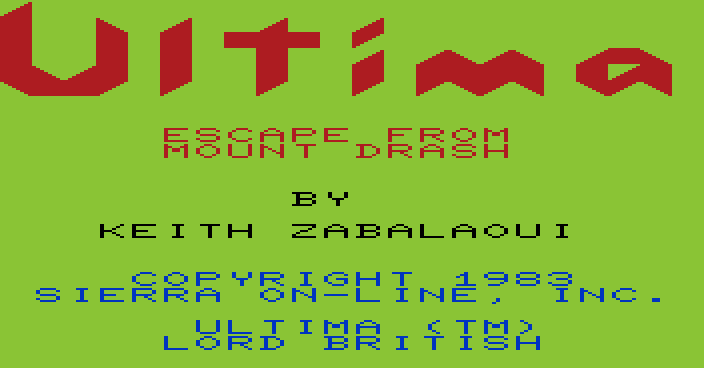 The cassette and title screen credit Garriot as owning the Ultima Trademark, while Sierra On-Line claimed ownership of the copyright to the game itself. Three of the monsters, gremlins in Ultima and Ultima II, floating orb/wandering eyes in Ultima, phantom/ghost in Ultima II. Purple Slimes come from D&D and the Dancing Demon was the name of a very famous program for the TRS-80. Without these Ultima references this game would probably have been forgotten by everybody. With the references few people outside of collectors and Ultima fans have any interest in the game. Sierra On-Line and Garriott's relationship deteriorated because of disputes over royalties of Ultima II and its ports. Garriott broke his association with Sierra Online to start his new company, Origin. Origin's first product was Ultima III - Exodus, signifying that Richard Garriott had taken his people and his series away from of Sierra On-Line. Origin eventually repurchased the rights to Ultima II from Sierra by 1989. Origin would retain its independence for a decade before Electronic Arts bought it. A long time ago I recreated in ASCII graphics each frame of the monster and players' graphics. They should be pixel perfect, and I used numbers to designate the color of each individual pixel. I did this to give my readers a sense of what the game looks like before I posted screenshots of each monster. Here I used a black background so I could actually color the text instead of merely giving the text color.